I created this recipe imagining it would serve four. But it was really too delicious and served two. Save your bacon grease from breakfast, it will add amazing flavor to this recipe. If you don’t have it, you can substitute butter. The sriracha gives this form a spicy kick. I served this corn with caramelized scallops paired with Sea Glass Sauvignon Blanc 2012 from Santa Barbara. This Sauvignon Blanc is amazing for the price and does not disappoint on a hot summer day. Heat the bacon grease in a skillet over medium and add the diced onion. Cook the onion until it is translucent. 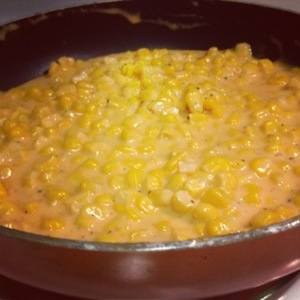 Stir in the corn, flour, and heavy cream. Bring to a simmer over medium heat and reduce the heat to medium-low. Cook for ten minutes until slightly thickened.